Kung Fu Panda Double Feature: two 2D sequences that bookend a 3D world. WE HEAR the stone-skipping sound (with the timbre of stone-plunking). WE SEE a laser-like lynx leapfrog and pad over looking glass, lemongrass, and lilies, launching to a lunette, and finally to a custom animation of a familiar logo. WE ENTER a den of Animal Kingdom Savagery by way of your favorite children’s book illustration. The shadow upon this rogue’s gallery is ours. Custom Made Dreams with James Baxter Animation. I can’t stress enough, neither the opening dream sequence of Kung Fu Panda nor the character animation in the end credits contain any CG animation. It’s all 2D / traditional / hand-drawn. The dream sequence was designed and laid out at DreamWorks Animation under the direction of Jen Yuh Nelson with production designer Ramone Zibach and art director Tang Heng, who developed the sharp, high-contrast, highly-graphic, anime-influenced style. Once the backgrounds were complete, they were delivered to James Baxter Animation – everything from animation through compositing of the final shots. James Baxter tackled the animation in unique ways: in one shot he would hand-draw the animation completely from start to finish, and in another he would do just a few drawings that were then manipulated in After Effects. In addition, all the effects animation consisted of traditional hand-drawn effects as well as digitally-manipulated elements from the original Photoshop files. Can you tell which is which? Being the master animator that Baxter is, the merging of the two is seamless. It helped keep the crew to only 12 people. Jen, Ramone, and Tang also designed the custom DWA logo sequence to perfectly match and lead into the dream sequence of Kung Fu Panda. We used mostly the same crew as on the dream sequence, but this time with animation by Rodolphe Guenoden. 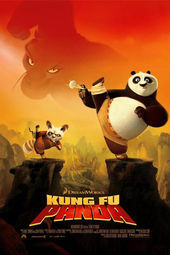 The 2D character animation for the Kung Fu Panda end credits was done in-house at DreamWorks and realized in the same extremely detailed and highly graphic style as the film’s opening dream sequence. Several DreamWorks animators were tapped for this sequence, while the clean-up, ink and paint, color styling, and compositing departments were all lead by the same crew who had worked at James Baxter Animation on the dream sequence. Working hand-in-hand with design and branding studio Shine on this was a real pleasure, with open and frequent communication being the key to the collaboration. Since Shine and our 2D animation crew were working on the sequence simultaneously, we delivered the rough pencil tests as early as possible to be used as reference for their camera moves and the ‘Po-dummy’ animation. The Po-dummy animation for each scene was indicated by the animators in the roughs but it was only in the clean-ups if the character directly interacted with it, as in the Shifu animation. Otherwise, a full turnaround of the dummy was drawn, finished, and delivered to Shine so that they could easily integrate it into their final sequence using the roughs as a guide, as in the Crane animation. All hand-drawn animation and clean-up was done on 16-field animation paper, which was then scanned into Animo for ink and paint and color styling, and then exported to After Effects for compositing. The final animated characters were delivered to Shine as TIFF sequences with alpha channel.